T-Shirt: "Heroes In An Art Shell"
Threadless has reprinted one of their classic T-shirts, featuring the design seen to the left. Yes, that'd be the namesakes of the Ninja Turtles playing Ninja Turtles. You can score your T-shirt here. 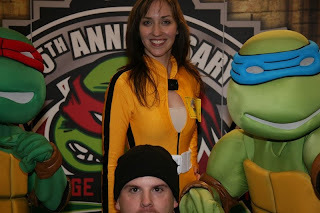 In 2006, after more than two years of pain in getting the Turtles costumes we commissioned delivered, and then wearable, four friends -- Dawnatello, Brinatello, GreenWillow, and Kimnardo -- and I braved the often brutal Comic-Con masquerade audience so that we could get jiggy to the original TMNT cartoon theme song and the ubiguetous Ninja Rap. Despite a near-complete lack of vision, no one fell off the stage (there are actually catchers in case you do!) and, for the most part, we pulled off our small bit of choreographed dance during the Ninja Rap. Not only did the crowd love us, but much to our surprise, we actually won a prize! And let me tell you, the look on the face of the guys awarding the "Best Movie Costume Recreation" award as five short women came running on stage in their de-masked costumes was as priceless as any other moment during the night! Mega fan Neil comes through once again, this time with video of the complete TMNT 4Kids panel that was on Sunday at New York Comic-Con. Hosted by Jake Black, this panel takes a look at 4Kids' TMNT series through the eyes of a table full of people who made it all happen. Check it out in six parts below. Friday night at NYCC there was a panel featuring four long-time TMNT artists: Steve Lavigne, Michael Dooney, Jim Lawson, and Eric Talbot. Moderated by occasional TMNT writer Jake Black, the panel was meant to focus on the artistic evolution of the TMNT. I don't know if they hit that mark exactly, but it was still a good hour-long conversation with these guys who have had so much creative input into the TMNT throughout the years. Mega TMNT fan (and reliable videographer) Neil came through with video of most of this panel for those of us stuck in parts of the world that are too far from NYC. You can check out the panel, in five parts, below. New York Comic-Con opened today, somewhat acting as the true kick-off of the TMNT 25th's anniversary "shell-abration." 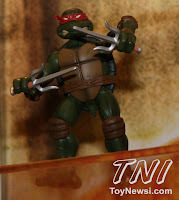 There is a handful of news and pictures being reported around the Interwebs, but I thought I'd start with a look at Playmates' new action figures that are supposedly based on the TMNT comics. Yes, I had to interject a "supposedly" in there. Since I'm so often accused of being overly negative, let's start with the figure I can say positive things about. 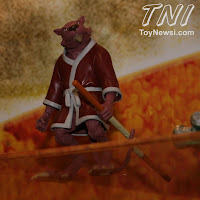 Splinter here is really quite nice looking. Does he at all resemble any artistic interpretation of Splinter in any of the comic books? Nope. But that's ok in this case; if the final product looks even a fraction as good as this picture, I'll likely be buying it. Here's Raphael, who seems to be the only Turtle representing (perhaps Playmates didn't want to deal with any "Why are they all wearing red?" questions?). Again, this is a good looking figure, though not really based on any of the comics. You'd think it'd be easy enough to get a Foot Soldier right, but this just seems to be a checklist of wrong. What's with the color choices? Why don't his knees bend? And what's with the pig nose? This figure is most unfortunate. But alas, even more unfortunate is Shredder. I don't even know where to start with this one. Absolutely no part of this figure is proportional with another part, his sword looks like a toy, and that helmet couldn't shred cheese. Oh, and based on the comics? Hell no! Turtle fans need to super glue their fingers crossed that the second wave of NECA figures eventually come out, because, in the ever-wise words of Princess Leia, they're our "only hope." Here's one more picture from the Playmates booth. I guess this is supposed to be April, but it doesn't take a genius to know that's Uma Thurman's outfit from Kill Bill. Here's a tip: Costume shops may not have generic yellow jumpsuits, but thrift stores do. But at least they have proper TMNT costumes, unlike what we saw at San Diego last summer. 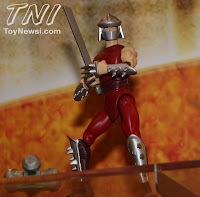 All pictures were stolen from Toy News International. You can visit the link to see more of their pictures from the Playmates booth. I'll be posting more New York Comic-Con news throughout the weekend.